The George W. Utech Congregational Hymnody Fund was established at the Eastman School of Music in 2011 through the generosity of Mrs. Krestie Utech in memory of her husband George, who was a published writer of hymn texts. Two of his hymns were included in the 1978 Lutheran Book of Worship: the Easter hymn “Look, Now He Stands!” (coupled with Carl F. Schalk’s tune Parsons) and “Great God, Our Source” (coupled with a tune of the same name by Gerhard M. Cartford). From its inception the Utech Fund has been administered by the Organ, Sacred Music, and Historical Keyboards Department at Eastman. The Utech fund is intended to support “the writing, composition, and promotion of texts and music for Christian congregational singing” as well as “educational initiatives most closely aligned with the intended purpose of the funds as related to Christian hymns and congregational singing.” Mrs. Utech’s generosity enables the Department to engage in four initiatives relating to the study and performance of sacred music: commissions of hymn texts and settings, hymn text and/or tune competitions, the biennial Utech Hymnody Symposium and Festival, and the Utech Hymnody Fellowship. Through a combination of commissions and competitions the Utech Fund fosters the creation of new hymns—poetic texts and musical settings. The first text commission went to Timothy Dudley-Smith, who, in 2012, provided three hymn texts based on Romans, chapter 8. Three composers were commissioned to set those texts: Carson Cooman, Scott Perkins, and Philip Stopford. Those three new hymns were premiered at a May 2014 hymn festival led by James E. Bobb, Assistant Professor of Organ and Church Music at St. Olaf College, the event held at Lutheran Church of the Incarnate Word, Rochester, which, not coincidentally, was George Utech’s home church. 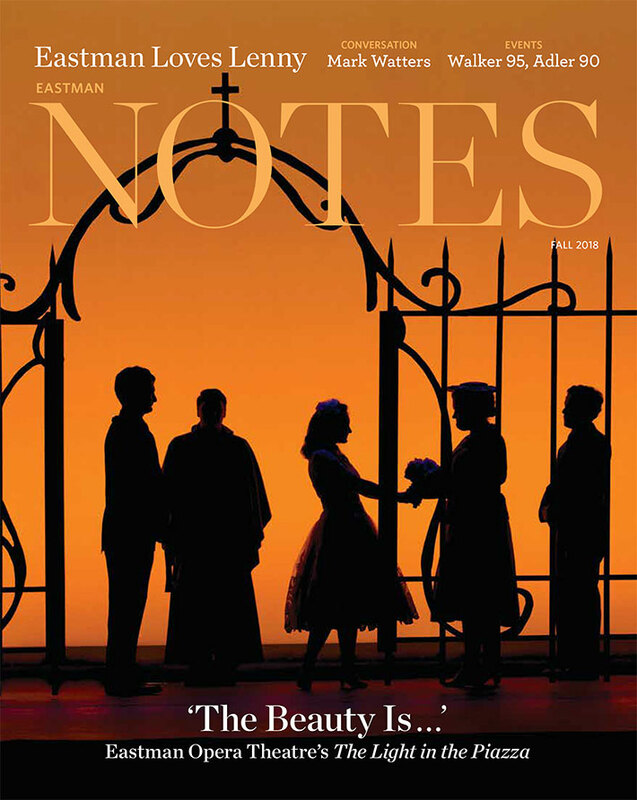 The second set of commissions was part of Eastman’s 2016 EROI Festival (Eastman Rochester Organ Initiative), which focused on “Breath for Singing: The Organ and the Human Voice.” On commission from the Utech Fund, Thomas Troeger provided a new text “Lord, Keep Us Modest When We Claim,” and Nico Muhly composed a setting (subsequently published in 2016 by St. Rose Music Publishing Co. and Chester Music Limited). The first text competition took place in 2017, specifying a text suitable for a hymnal category of “Gathering,” “Beginning of Service,” or “Morning Hymns,” the text to be sung to either of two Genevan Psalter tunes: Psalm 136 or Psalm 138. The panel of judges—Emily Brink, Carl Daw, Sister Delores Dufner, and Martin Jean—evaluated 28 text submissions anonymously and unanimously chose a text by Wayne Wold entitled “Voices Arise, Let Joy Be Heard,” sung to “Psalm 138” from the Genevan Psalter. The first singing of this hymn occurred at the 2017 Utech Hymnody Symposium and Festival. The Utech Hymnody Symposium and Festival takes place in odd-numbered years (opposite the EROI Festival in even-numbered years). The first one occurred on November 17–18, 2017 and featured Paul Westermeyer, Emeritus Professor at Luther Seminary, St. Paul, Minnesota, providing the keynote address, and Bruce Neswick, Canon for Cathedral Music at Trinity Cathedral, Portland, Oregon leading a hymn festival and a master class in hymn playing and hymn-based improvisation. The Utech Hymnody Fellowship within the Department of Organ, Sacred Music, and Historical Keyboards allows a graduate student to assist with the commission and competition programs, and to complete a one–semester independent study related to hymnody, as defined by the student’s interests and in conversation with an Eastman faculty member supervising the independent study. The first Utech Fellow was Jacob Taylor, a DMA student in the studio of David Higgs. The second Utech Fellow is Isaac Drewes, a MMus student in the studio of David Higgs. Through these four interrelated dimensions we aim to honor the interests and accomplishments of George W. Utech in the area of hymnody—by nurturing the writing and composition of new hymns, and by educating future generations of church musicians in this rich and vital area of sacred music.